If you stood on a street corner and asked people to define domestic violence, responses would likely focus on visible physical injuries. Assaults. Emergency room visits. Battered women. An out-of-control, raging, drunk man. And while these ideas may be a part of the picture, they are but a teeny tiny snapshot of domestic violence. Yet most of us, including many victims, don’t recognize the signs of abuse that are much more common. Domestic violence is a pattern of coercive control utilized by an individual (typically a man) to maintain power over an intimate partner (typically a woman). This pattern of power and control may include acts of sexual and/or physical violence, but typically less frequently than other strategies. If I could only use one handout for the rest of my counseling career, I would choose the power and control wheel. Hands down. It has been the single most useful sheet of paper I have reviewed with clients in any counseling setting in which I have worked. It has produced the most frequent “light bulb,” “ah-ha,” “oh wow,” “THIS is it” moments with clients. 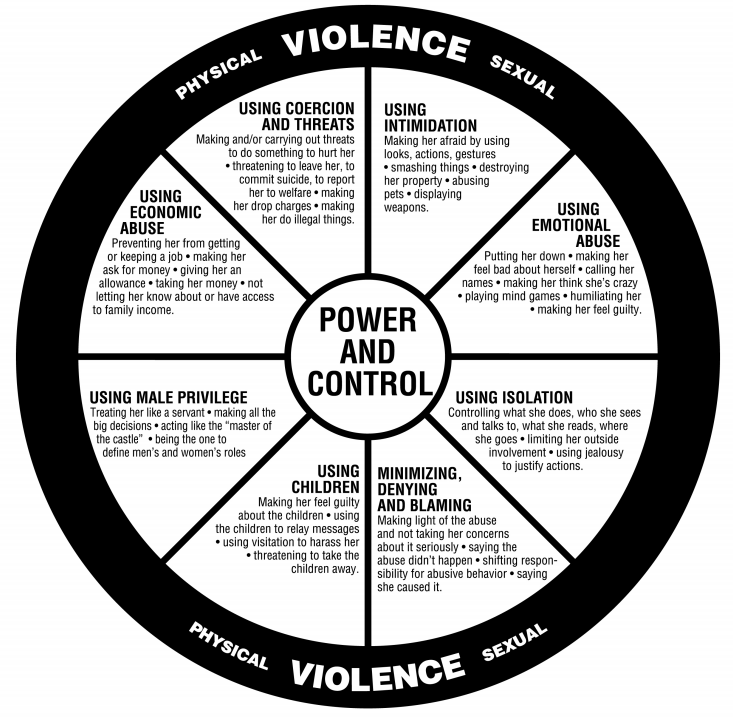 The traditional version of the wheel describes eight typical strategies utilized by domestic violence perpetrators: coercion & threats, intimidation, emotional abuse, isolation, minimizing/denying/blaming, using children, using male privilege, and economic abuse. Each of these spokes is connected to the central driving force of establishing and maintaining power and control over the victim. Sexual and/or physical violence may be used to reinforce that control. Not every strategy will be used in every situation. Some abusers will only utilize a few, some will use all of them, some will change their approach over time. They will employ whatever methods seem to be the most successful at maintaining control. I could share story after story with you of examples for each part of the wheel. And while each victim’s experiences are unique, my clients also repeatedly express a sense of shock at just how well the power and control wheel describes the abuser in question. I have had many clients make exasperated statements along the lines of “oh wow, they’re all the same”or “do they take a class in this? !” I was sharing a power and control wheel with a client once because I was wondering if domestic violence was occurring and before I could finish she had grabbed a highlighter off my desk and started marking all of the things her boyfriend was doing. Many of my clients express feelings of relief as well as disbelief when they see a power and control wheel for the first time. They are relieved to begin realizing that they are not “crazy” and have not been imagining what has been happening. They are relieved to begin finding language that expresses their experiences. 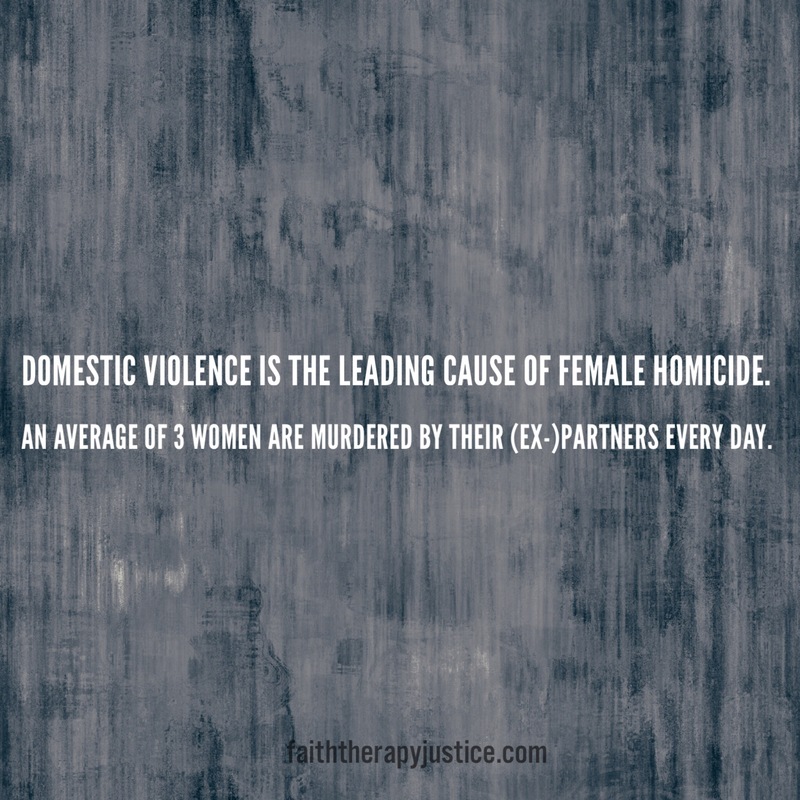 They are also often in disbelief at how many of their partners behaviors were/are signs of domestic violence. At how many behaviors constitute abuse. Again, we tend to focus on physical violence when hear the term domestic violence, often missing other abusive tactics that are occurring. Which is where we all come in. We must call domestic violence for what it is. It is, in fact, violence. Regardless of what (if any) acts of physical violence have occured. It is abuse. Controlling behaviors are not okay. They are not justifiable or excusable. They are signs that something is not right and has the potential to become increasingly physically violent and dangerous. The emotional toll on victims is also profound. Many women experience symptoms of PTSD as a result of domestic violence. I have had many clients tell me that healing from the emotional abuse is much more challenging than healing from the physical abuse. We must also recognize that the responsibility for change lies solely with the perpetrator. It is not the responsibility of the victim to better herself, to fight for her marriage/her family, to “love him out of it/through it.” This is dangerous. When the community holds these types of beliefs, perpetrators have very little motivation to change. And victims often go without help. If they do find the courage and resources to leave, they quickly discover that leaving is always a process when it comes to domestic violence. Abusers do not simply relinquish control and move on. They will employ any number of strategies (from promising change to threats and everything in between) to regain power over the victim. This is why leaving is the most dangerous time for a domestic violence victim. This is the most likely time for an abuser to kill the victim (and often any children involved and himself), the ultimate act of exerting his power. While difficult to measure, estimates are that 1 in 4 women will experience domestic violence in their lifetime. That is a HUGE number. So let’s become more aware of what it actually is. If you see some of these patterns in your own relationship, I encourage you to talk further with a trained domestic violence advocate – you can call (or chat with) a local or national hotline or contact your local provider. They can ask additional questions to help you better understand the level of risk you may be in, to discuss resources available to you, and to help you plan your next steps (whatever you want them to be). We all need to learn to recognize these patterns. 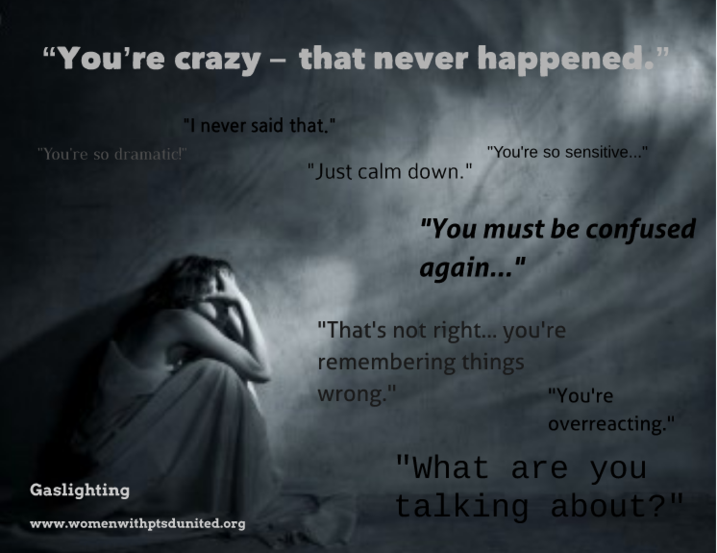 To BELIEVE victims when they express concerns (and to be PATIENT and supportive) and to validate what they are describing (abusers will try to convince victims that it is their fault, that they are exaggerating, that they are crazy, etc). To ask how we can help. To hold men accountable for their behaviors. To speak up. To name it. Let’s get to work. We all have a part to play in this.